While nations dither on climate, Jodie Van Horn of Sierra Club reports on cities switching to renewable energy. Lifetime activist Campbell Plowden on the real way to save the Amazon rainforest – the “lungs of the planet”. The flood waters from Hurricane Florence rose all last week, long after the storm had passed. Slowly the real news about damage is also leaking out. Duke Energy admits that coal ash at the L.V. Sutton Power Station in North Carolina has escaped. The Cape Fear river flowed freely into an artificial cooling lake at the site, and then a steel wall separating the toxic coal ash from that “lake” went underwater. It’s a breach, and coal ash could be flowing already into the Cape Fear River, with over 100,000 people downstream in Wilmington, North Carolina. That coal ash will mix with massive tons of hog manure. Those mega-barns full of animals went underwater. I saw some of the long low shed in aerial shots on TV. We didn’t see any pig farm rescue footage, so I’m guessing thousands, to hundreds of thousands of pigs drowned. I guess we won’t see that in the storm mortality reports either. But wait, you can get a full report on farm animals and Florence from alternative radio. Robert Grillo reports. The September 21st “Animal Voices” show on CFRO Vancouver is up on their web site at animalvoices.org. Find it here. At least the breach wasn’t at one of Duke’s nuclear plants. So far as we know. I saw an article before the storm about those reactors most at risk (a dozen or so, including at least one Fukushima-style GE Mark I reactor). But no update on those plants. I have to check around. This isn’t the first time around for mega-flooding in the Carolinas. Our guest Jodie Van Horn will tell us about the South Carolina State Capital – Columbus. Three rivers there hit record flood levels and swept through the city in 2015. Columbus residents called on the City to head for a renewable future with less extreme weather. The city joined the 100% fossil-free movement. You’ll hear all about it in this program. Then we head to the Amazon rainforest, with Campbell Plowden, a life-long activist who has lived there. We talk about what works and what doesn’t, if we want to save what’s left of the “Lungs of the Planet”. And in all that – we will get good news about choosing sanity in these daunting times. If this show seems too hopeful and upbeat for you, don’t worry. My guest next week may crush all that. Last week, a couple of people made donations to help keep me going. Thank you folks – it all helps. Plus a special thank-you to my sponsors who donate $10 a month. That is how the bills get paid for long-distance calls, keeping the Ecoshock web server open to free downloads for anyone all over the world, and other incidental costs of producing a weekly radio show. If you can help, please do! I can keep this program going as long as my health allows, but I need your financial support to keep my studio running, and my own bills paid. Can you help with a donation or membership now? It only takes a minute, here. Are you tired of watching national politicians drive us backward over the climate cliff? Look away, because there is new green growth at the roots. Hundreds of cities around the world are heading toward 100% clean energy. You may be thinking Europe or Australia – but American cities are withdrawing from fossil addiction, and not just in California. Jodie Van Horn is Director of the Sierra Club’s “Ready for 100 Campaign“. She is helping to power up America in a more positive way. We will talk about real action to cut emissions. It is happening in cities from Texas to flood-ravaged South Carolina, from New England, to California. Plus, we take a quick look at the Global Climate Action Summit in San Francisco this September. It is truly remarkable that towns and cities right in the heart of oil and fracking country are moving fast toward wind and solar power. Two of America’s biggest coal companies are headquartered in St. Louis Missouri. It sounds like political suicide to promote 100% clean energy there. Yet local politicians overcame coal industry objections, when the President could not. Jodie says that is because voters there made it clear: they want clean power. The “Ready for 100%, 2018 Case Study Report”, is free, and you do not have to join the Sierra Club to get it. Use the web site readyfor100.org (which redirects to https://www.sierraclub.org/ready-for-100 ) Or grab it here. Google has announced a new service that will eventually show the greenhouse gas emissions for every city. So far, they have mounted those graphs and maps for 5 cities, including Buenos Aires, Argentina and four in the United States. This could help activists push their cities forward toward 100% renewable energy. That news comes in an article from The Atlantic, and you can check it out directly on Google’s Sustainability Insights here. Jodie attended the Global Climate Action Summit in San Francisco, September 12-14th, 2018. Other well-known participants included Alec Baldwin, Harrison Ford, Van Jones, Tom Steyer, Michael Bloomberg, Nancy Pelosi, Al Gore, Dave Matthews, Jay Inslee, Bill de Blasio, John Kerry, and George Schultz. At the second day of the Climate Action Summit, Jerry Brown’s partner and former New York City Mayor Michael Bloomberg, said 27 major cities peaked their carbon emissions by 2017. London, Berlin, Los Angeles, New York, Paris, and San Francisco were on that list. That is a start. But…according to a study released this year by the Norwegian University of Science and Technology, New York City, Chicago, and Los Angeles are still in the top 10 worst carbon polluters in the world, along with Seoul Korea at number one, and Guangzhou, China at number two. It seems like big cities still have a long, long way to go. The researchers have also created a website (at http://citycarbonfootprints.info/) where you can look at the carbon footprint of your own city. Los Angeles Mayer Eric Garcetti claimed his city added 29,000 clean-energy jobs in the last five years. There is a strong case for clean energy conversion – as a boost to American jobs. You can find a good summary of that summit here, from Mongabay. Too many national governments are stumbling on climate change. We know Donald Trump has slashed rules meant to protect the climate and withdrawn the United States from the Paris Climate agreement. There is backward blustering in Australia and some East European countries. Even in Canada, Prime Minister Justin Trudeau approved a pipeline running from the tar sands to the port of Vancouver. When private companies couldn’t build it, Trudeau bought the unbuilt pipeline project for $4.5 billion in taxpayer’s money. Apparently big fossil fuel money can buy federal politicians. But local governments have to answer to local voters – and those smaller governments are starting to drive climate action from below. That is another whisper of hope. “The lungs of the planet.” The great Amazon Rainforest is shrinking again as humans expand our damage. We can study it, or see photos from space, but what is happening in the forest, on the ground? Campbell Plowden knows. He lived in the Peruvian Amazon jungle for a couple of years while getting his Doctorate. Campbell travels there regularly. He knows the people and the reality. Plowden did his PhD study later in life, after a career as an environmental activist for many groups. Back in the 1980’s, he was the International Whale Campaign Coordinator for Greenpeace, and then International Tropical Forest Campaign Coordinator. After that he went deeper into South America with Amazon Watch. 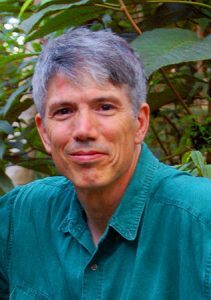 We talk about the Camino Verde project and his Amazon Forest Roadshow in the Northeast U.S.
Campbell Plowden is the Executive Director at Center for Amazon Community Ecology. Find out more at www.amazonecology.org . At 18 minutes into the Campbell Plowden interview we learn that global warming is already causing excessive ice melt of glaciers in the Andes. This runoff water is causing flooding further down the mountains to homes, agriculture and infrastructure like roads. Tens of thousands of people were displaced by the extra high floods in the Equitos area of Peru. Peasants with houses of stilts were still inundated. They lost their crops, and so food, and lost forest materials for crafts, and so a source of money. That’s a new twist on that story. I’ve read and hear worries that the last great glaciers in the Andes are melting and will disappear. Those waters are the only source of drinking water for many South American cities, including the capital of Bolivia. Cities and agriculture is threatened in the Andes, as global heating causes the glaciers to disappear, just like the last glaciers in “Glacier National Park” in the United States. But in the MEANTIME, the runoff is causing chaos for many communities downstream. First the floods, then the permanent drought. The biggest challenge and opportunity for the Amazon is to transform the vision of development that impacts its water, land, plants, animals and people. The current model promotes the production of mass commodities. The new model needs to focus on sustaining diverse human and other biological communities. Plowden’s anti-whaling song in 1988 “Chill the Whalers” (in a player on SoundCloud). Campbell on local radio – Central Pennsylvania WBLF at state college. I also like this article from Mongabay: “Tambopata: Where forest conservation and opportunity meet” by Heather D’angelo on 19 April 2018. Fair Trade Federation from The Invisible Lens on Vimeo. It is time for me to be gone, for this week. I’ve got tomatoes to can and some wood to bring in. Please join the party again next week, on Radio Ecoshock. Please don’t forget to help me keep this show going, if you can! We are on track to hit 1.5 C by 2030, 2.0 C by 2050. Dangerous climate change = 1.0 C.
To avoid 1.5 C, we must reduce emissions 50% in 10 years. To avoid 2.0 C, we must reduce emissions 100% in 20 years. A 100% energy transition takes 50 years minimum. This is because electricity is only 20% of the world’s total energy use.